Looking back to the future? On October 30, 1935, the Composers' Forum-Laboratory, designed to provide an outlet for American composers during the Great Depression, opened in New York with a program of music by Roy Harris. The Forum was an outgrowth of the Federal Music Project, a division of the Work Projects Administration, which was established as a national agency on May 6, 1935, by an executive order of President Franklin Delano Roosevelt. At its peak in 1936, the FMP, which began as a distinct division of the WPA on August 1, 1935 as a means to provide work for unemployed American musicians, involved a total of 15,000 musicians. The emerging consensus that the world financial system and the economy have changed is some fundamental ways, and introduced tremendous uncertainty, has registered even with people like myself, musicians, whose chief line of production consists of pushing molecules of air about here and there. This has been registered most publicly with the largest institutions — opera houses, orchestras, ballet companies, conservatories — which have begun to take measures for a far slimmer future, with reductions in both state subsidies and private/corporate patronage now incorporated into plans for this and future seasons. To some extent, the institutions have become well-practiced in such economizing, perhaps even inadvertently serving as models for some of the large financial institutions that now find themselves in trouble. After all, isn't a bank that is now "too big too fail" something like one of those orchestras or opera houses (especially in European capital cities) which have been able to present themselves in the recent past as "too important to fail?" Frankly, I have few worries about such houses and bands, as their connections to business and political establishments are probably secure, even in the roughest of times. My fear is instead that the greater effect of the changes to come will be felt not by the handful of major institutions that can claim such a status, but rather by smaller organizations and individuals who have either not yet established such institutional status or, by nature, have no interest in such a status. Although perpetually under material pressure, it is these organizations and individuals which are the greater source of liveliness in our musical lives, and my fear is that, as close to the tipping point between fiscal survival and disappearance is they have always been, the slightest further push could be devastating. But what if this moment is one of economic opportunity and not just severe restriction? Let's have a little vision, now! What if we could re-organize our musical lives in a fundamental way, with the basis not in our music-institutional lives but in music-making at the most local level? In part, I believe that we have already moved in some important ways in this direction. The large corporate recording industry has lost considerable weight and technological advances have made it now possible to produce the most sophisticated recordings and broadcast-equivalents with means modest enough to be available to a middle-class household. My own professional and personal interest is in a serious revival of music made at home or among friends. I am far from certain what economic model could, let alone will, make this happen, but my instinct is to be optimistic. A.C. Douglas writes: "Every piece of stand-alone music traces out, from beginning to end, it's own perceptible, coherent musical narrative absent which what's written is gibberish, not music." I like telling stories; late at night, especially, I can hardly be held back. I even like the idea that music can tell stories, or at least, may have a compelling thread holding a whole work together in the musical — read moral — equivalent of a narrative. Some of these stories are explicitly composed into works and then either explained or kept private, others are imagined by players and listeners, often composers, players, and listeners imagine completely different narratives for the same work. But don't confuse narrative with coherence! Coherence, in music, is a presumption of repetition or return, and if it begins Once upon a time, you don't get a second chance to get it right. Some narratives, whether stories told or pieces of music, don't hold together particularly well and suffer not the least for it. Indeed, the compelling element may be a failure to hold together; they simply fall apart in the way matters in real life often fall apart, but the way, the style if you will, in which they fall apart, or even the mysterious circumstances of elements which may or may not belong together or which never quite come together, can be so well done with the individual elements drawn so vividly, that we are drawn in regardless of any failure to satisfy an urge to cohere or close. Indeed, there is as much potential for satisfaction in the episodic and fragmentary as in the through-composed and tightly-knit and, possibly, more excitement in the former. Schumann's setting of Heine's Im wunderschönen Monat Mai doesn't properly begin, has an ending is anything but conclusive, and everything between beginning and end frustrates the sense of direction, yet it may well be the perfect song. Moreover, there are extraordinary works of music in which narrative plays no role at all. There is no common thread to holds the Machaut Mass or the Monteverdi Vespers together other than the sucession of astonishing displays of technique and grace. The idea of a common idea linking the movements of a symphony or a quartet came late and didn't really come often. Even the idée fixe in the Symphonie Fantastique — really an afterthought — is unnecessary, as is any knowledge of the appended fantastic story (the same goes for the silly titles appended at a publisher's behest to Schönberg's Five Pieces for Orchestra). In fact, the principles underlying the supposed coherence of much of the work we believe we treasure for integrity and closure are actually contrast, complementarity, and assertion, the creation of facts on the musical ground with cheerful disregard for the norms of an orderly narrative, for example, those of tonal function. Even at the most local level, music can defy an orderly progression of time (in well-ordered time, what goes up must come down, arsis is answered with thesis, but consider the Sarabande rhythm, which begins its three-beat measure with two heavy downbeats followed by only the lightest of upbeats, an afterthought, insufficent to create any restorative balance, but create plenty of forward, if halting, momentum). It was of a night, late, lang time agone, in an auldstane eld... But I digress. The notion of a narrative in a work of music presumes the immanence of the work's ending; but much of the time spent within a work of music, is time spent unaware of, indeed unconcerned about, such an end. A piece of music may even forego a proper ending, segueing into something altogether different, fading off, or just stopping, without regret. Living, as it were, happily ever after. A piece of music can get 'round to its beginning well after it has started and end well before it stops, and that beginning need not proceed the end. Do you doubt me? Listen four or five times to the Symphonies of Wind Instruments and call Dr. Wolf back in the morning. There is a huge gray zone in composition between influence and larceny. All composers work under the influence of the music and musicians and ideas that surround us. We are deeply influenced by our heroes, our teachers, and our colleagues. And even when we try to work things out for ourselves from first principles or the compositional equivalent of reverse engineering, tradition provides an unavoidable and enormous background radiation. If we don't consider this in the evaluation of our work, our players and listeners surely will. The quote famously attributed to Stravinsky goes: "Good composers borrow. Great composers steal." (Another version of the quote deflates the "good" to "mediocre" without deflating the sentiment of the sentence). It would actually be more to the point if it ran "the great composer knows how to steal and not get punished." The skill is appropriation, taking goods that do not belong to you, and making them so much your own that the community identifies you with them. Appropriation is something fundamentally different from imitation; like most trained musicians I can fess up to the ability to forge a page of music that looks all the world like composer X,Y, or Z, but actually turning that page into interesting music goes several steps beyond forgery. In a marketplace like that of contemporary music, in which the supply of new work is in perpetual surplus to the demand, establishing an recognized identity within the market becomes an essential survival skill for composers. On the one hand, this identity is about distinctiveness, that which you do which no one else can or will do, but on the other hand, this identity is very much about likeness, establishing relationships to the familiar, new & improved, perhaps, but related enough to known sounds or styles that the possible player or listener has a handle, and you a hook to draw them in, as commissioners, programmers, performers, and listeners. A compositional identity is as much about what you don't do in your music as what you do do in your music. Getting out from under the influence is as hard a part of the apprenticeship and journeyman years as anything, but ultimately more rewarding. I've played Javanese gamelan, Karawitan, for almost 30 years now, and I remain, cheerfully, an amateur; playing gamelan has become both a refuge and a mirror to my other musical work, a domain in which I'm still learning and far from in control. With the exception of one small piece very long ago, written when I was 18, any influence of Karawitan on my own work has been either very deeply hidden or just a passing nod on the surface of music with substantially different concerns; indeed, the more I know about this music, the more cautious I am about how I use it. Am I under the influence? Yes. Will you notice that influence in my music? Probably not. Recently, in the course of reviewing my ideas about musical time, rhythm, metre, tempo, etc. , I began to go through David Nelson's supurb introduction to the spoken rhythmic solfege of South Indian music (David P. Nelson, Solkattu Manual, Wesleyan Univ. Press 2008). Solkattu is perhaps the most impressive bodies of musicianship techniques in the world, and the elegant structure of the South Indian tala system is close to my own thinking, especially the construction of metres or phrases from smaller units, and then variations based on both subdivision and addition, with a special virtuosity in overlaying patterns which do not immediately come out together. However, my approach to Solkattu, my appropriation, is already irreverent in that I write out the patterns in the notation I know best, I don't use the original terminology or syllables (preferring "one-ee-and-uh" or "paradiddle" to ta-ka-di-mi), and I have only a passing interest in the particular collection of forms associated with the tradition. Whether my appropriation is successful or not remains to be heard, but at the very least, I have absolved my source of any responsibility. First blogging economist Dani Rodrik and then composer/writer Charles Shere recommended Nassim Nicolas Taleb's book The Black Swan. Such recommendations are worth taking seriously, and the book, which is about the impact of highly improbable and unforeseeable events, is definitely of interest to composers. Now Shere has pointed to a conversation on the recent economic developments between Taleb and mathematician Benoit Mandelbrot here. Composition is a balancing act. The greater part of music (the dark matter or passagework) is the routine, the continous, the predictable, the necessary background against which the rare event, the extraordinary, becomes extraordinary. Getting the relationship between these two elements right makes all the difference between just pushing sounds around and making that elevated experience we identify as musical. * Of other aesthetic fields, is it even necessary to mention Walter De Maria's Lightning Field, the most important work of visual art of our time? ** It has been my personal experience that the framing strategies of the minimal composers and the chance- and contingency-derived strategies associated with Cage have been more reliable than those of the complexity school, in which the relationship between audition and process is too often miscalculated if not ignored, leading necessarily to an impressionistic or gestalt-oriented form of listening, in which case the compositional effort must be regrded as highly inefficient. If our interest is in a music which can only be apprehended impressionistically or as a series of gestalts, then there are any number of more efficient techniques for arriving at such musics. Am I the only composer out there who is finding it tough to settle down and write music because of anxiety over the US election? The two terms of the present Bush administration have sometimes made it hard, and often awkward, to be a yank living abroad. The usual charitable distinction between individual citizens and the policies of their countries has frequently been forgotten in the last seven+ years. While any new administration will have its work cut out, and is bound to offer some major disappointments when actually creating policy, the possibility of finally having even the slightest movement, if even just a change in tone, is so welcome that I simply find myself killing time (writing little exercises in style imitation, for example, a couple of which have appeared here, fussing with music fonts, making large batches of tamale for the winter or playing rounds of Liverpool Rummy with the family) rather than getting on with the more essential musical work. Honestly, since my ballot has already been sent away, I'd probably be happiest going into cryogenic suspension and getting unfrozen sometime after all the votes have been counted and we really do know that this era has come to its end. Years ago, I gradually came to feel more and more that the whole notion of a 'crisis of language' that would have come with atonal practice is extremely misleading and has led composers to confuse languages and compositional methods (and leading to sometimes very arbitrary ideas about how to 'construct' a language - you find this tendency among academic modernism just as much as with people who decide to write in what they think of as an 'accessible' style). Whereas in early free atonal works it's so clear that works, in all the aspects of musical thought, are constantly referring to existing musical language. I agree with Vriezen, especially about our tendency to hear works of music as determinative of subsequent works, which has the effect of re-writing the earlier music into the narrative that happened to "win", rather than the concerns of the moment. We encounter revisionism of this sort all the time, not only for the tonal/late tonal/atonal/serial cluster but for the embalming of the later works of Mahler into a death narrative (a death the composer hardly anticipated), elevating Shostakovich or Britten to heroes of political or social resistance, or the (in part, commerce-directed) series of repackagings of the minimal/ist/ism label. Renewing our acquaintance with a given music, as listeners, performers, and composers, has got to be about learning to listen to the music with ears as fresh to the possible consequences that the music embodied and implied in its moment of origin as to the limited consequences that actual music history followed. The luxury here presented by music comes by virtue of its ephemeral status; when a work of music is revisted and reconsidered, its implications are still fresh and can result in entirely new modes of listening, styles of performance, and, in response, new composition. Music history is not necessarily a straight narrative, and no cul-de-sacs in musical history are necessarily dead ends. That's why some of the most interesting free atonal or minimal music is being composed now, and that's why we may usefully consider the possibility that Mahler could have been (and indeed, was planning to be) around long enough to write another half-dozen or more symphonies, maybe even an opera or two. But, if I might be permitted a tangent, I'd like to go a bit further on one point. Perhaps it's time to take some steps away from the use of the work "language" with regard to music. Sure, music and language share features and, from the non-negligible physiological standpoint, share a whole collection of perceptual and cognitive organs. But it's not unusual that organs have multiple functions or applications; that whole assembly of organs known as the mouth is used for breathing and nourishment and the occasional bit of regurgitation as well as the whole swathe of acculturated oral pleasures, among which speaking and singing are but two. We're pretty well obsessed with the relationship between speech and singing, but that between breathing and singing is as important, and the relationship of song to other non-verbal utterances is presumably non-trivial. Speech and music do, indeed, share the hearing apparatus, but the phonology of speech, as demonstrated by sign languages, does not require any acoustic component, it may be entirely visual. As far as I'm concerned, a much more interesting case of sharing organs does take place in the ear, which are not only good for listening, but also house the organs for equilibrioception, which keep track of angular momentum and linear acceleration, through which the body senses its movement, direction, and acceleration, and thus attains and maintains postural equilibrium and balance. In combination with the echolocative functions of listening, the ears are absolutely critical to our perception of space. The cluster of questions that I'm touching on here often comes back to the question of the origin of music, and many linguists (and, to be fair, musicians) like to present music as a bonus — Marxists might speak of a superstructure (Überbau) — piggy-backing on top of the organs and structures used by language, which is considered essential for human survival and development. But the possibility of music's orgins in some fairly complex spatial and temporal functions, with the closely related phenomenon of dance, is not to be neglected. Indeed, one may well take to song not to communicate, as heightened speech, this or that (anyone remember Mel Brooks' 2000-year-old man, who stated that the first song was "A lion is eating my foot off, somebody call the cops!") , but rather to help find your way in the wilderness or to keep track of passing time. I've been collecting some challenging music for a young violinist, a daughter of a good friend, to play. During my search, I spent some time with Anton Webern's Four Pieces (Vier Stücke), Op. 7, which, dating from 1910, are no longer functionally tonal but at the same time are still some several important steps away from the formalities of the twelve tone technique Webern would eventually franchise from his teacher, Schönberg. 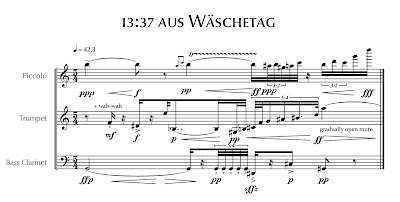 Like other works of this moment — often identified as "free atonal" — it is fascinating to hear music with such a coherent body of techniques but applied with improvisatory spontaneity and no compulsion to submit to strict restrictions. 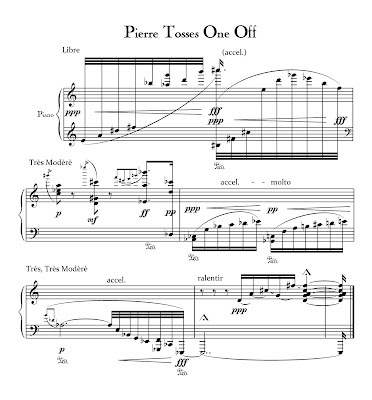 There are some awkward moments here, for example in the use of octave dyads in both the piano and the violin, which come across as fairly heavy-handed orchestration, and I'm not altogether certain that the second — and most complex — piece works at all, but for the most part, this is music sensitive to every detail, espressive but not pumped to the level of the hyper-expressionism of Schönberg. Recalling traditional tonal practice, if only emblematically, single tones aquire local and global importance if not exactly tonicization, there are numerous small repeated patterns and some substantially long sustained tones or chords, within and against which the sensual aspects of tone combinations are far from forgotten (as in the opening of the third piece, in which the violin sustains a low "a" for about 20 seconds, during which the piano strikes tones which create vivid acoustic beating (in Mikrokosmos, Bartók used the word "buzzing" for the same technique)). Looking forward to future concerns, the pitches used tend to fill up clusters of neighboring semitones, with new pitches tending to complement neighbors, but unlike full-blown twelve-tone music and quite a bit like some music of Wolpe or Feldman, there is no regular consumption of entire twelve-tone collections. With such an abundances of semitones, and semitones displaced by one or more octaves, this music is filled with leading tones and, indeed, the tonal practice retains other important voice-leading features: melodies, while not quite tunes, have clear contours, with melodic leaps either turned into arpeggios or met by compensatory motion in the opposite direction, and the relationship between voices — yes, this is still music in which one hears voices — exhibits elegant voice leading, for example in the use of contrary motion between the pianist's hands. Contour and register are often the most important elements; the registers chosen for the individual instruments tend to frame each other, with tactical use of empty registral spaces. 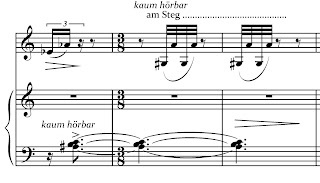 Little details matter here in a big way: the fourth piece closes with a descending arpeggio from high up in the violin, very quietly, am Steg, and marked "like a breath" (wie ein Hauch) which repeats even more quietly, but metrically displaced from the downbeat to a pickup. That little bit of displacement literally takes your breath away. With my recent thoughts about the not-yet-tonal, it is a pleasure to spend time with some music that is no-longer-tonal, but not-yet-completely-not-tonal, and thus, still open to a rich variety of potential alternatives. There is quite a bit of formal research into the readability of text fonts. For music copying and engraving, it appears that there is quite of bit of hearsay and very little research about readability, much of it fairly hardened into rules about notation style, particularly in commercial music, for example the inkpen-styled fonts preferred by many for jazz or show charts. Is anyone aware of any actual research along these lines that might be useful in improving score design, typography and layout? One small note about Cooper & Meyer's The Rhythmic Structure of Music. This book is not really a general theory of rhythm but rather a stratified theory of accent in a rich but narrow slice of the European tradition, developed in acknowledgement of work by Lorenz and Schenker. For the repertoire represented by that tradition, the book is indeed enormously useful, particularly to performers. Cooper & Meyer adopted the classical prosodic feet (iamb, anapest, trochee, dactyl, amphibrach) but in modern fashion, as strings of strong/weak stresses rather than the long/short durations of classical Greek and Latin. Coming from classical prosody, I keep having to twist my mind around Cooper & Meyer's terminology, as in their largely duration-independent scheme*, they use "accent" for what I would call stress, and reserve "stress" for an additional degree of emphasis, often one in contradiction to the usual pattern. This twisting tightens to a particular degree of intensity with their analysis of a bit of Dufay's (sophisticated and stunning) Missa Sancti Jacobi, in which long/short durations play an important role and, curiously enough given the serious issues of metric division at play, the authors use a modern notation with note values halved, barlines added, and no indication of the original time signatures which would be rather useful in sorting our more precisely what Dufay had in mind. * The independence of the system is such that, in principle, any element (pulse, tempo, duration, metre, melody, harmony, orchestration etc.) could each be used to support or project (or conversely, to contradict) accents. Virgil Thomson: Sonata da Chiesa (1926) for Eb clarinet, trumpet in D, viola, horn, trombone. This is one of the strangest pieces written in a decade delightfully full of strange pieces. Thomson himself considered this to be his "master-piece," in the historical sense of a work written by a journeyman to demonstrate technical command of a craft, and in this case, the dissonant style of the era. (It's composition coincided with the composer's final studies with Nadia Boulanger, and the Sonata da Chiesa must be counted with Copland's Organ Symphony, as among the strongest works to come out of that famous boulangerie). The strange mastery at work here is most apparent in the instrumentation. The ensemble inverts the usual balance of more strings to fewer winds, and more woodwind than brass in favor of more brass, a single high clarinet and a single string instrument, and that one, the viola, which is least heard soloistically. There is a deliberate choice of instruments with uneasily-matched tonal preferences, with the eb clarinet and the d trumpet more or less dividing sharp and flat keys between one another. 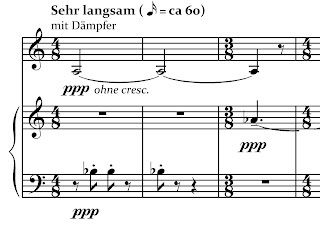 Thomson uses ensemble scoring patterns in which none of the instruments is used strictly or consistantly as a high, middle, or low voice, thus the little eb clarinet in chalumeau register can function as the bass and the trombone as a superior alto voice. Strangest of all is the question of genre. Thomson identifies the piece, by its title, with an Italian baroque form, not the secular sonata, but a multi-movement form intended for use in the Catholic church. But this Sonata, with three movements taking the forms of a Chorale, a Tango, and a technically extravagant Fugue (in which material from the chorale returns with a menace), while ornately baroque on its own terms, is American, more specifically African-American, and churched in an African-American protestant tradition, narrating — if we can trust John Cage on this point — a remembered visit to a Kansas City church service, complete with sermon and congregational response, centered about the Tango's direct confrontation with the diabolical, and with the polytonal fugue suggestion some form of redemption after temptation. It is easy, too easy, at this historical distance, to be uncomfortable with Thomson's racial views, which were liberal but still of their time, and to take this work as a somewhat illicit form of appropriation, but I increasingly hear this piece as an honest act of appreciation and, in his mixture of modernity and elements exotic to both Thomson's white Kansan and European musical roots, something much more than a journeyman's diploma piece. For many years, and only half-jokingly, I've referred to my harmonic practice as "disfunctional harmony". Taking as a model Charles Seeger's essay on Dissonant Counterpoint, in which the structure of species counterpoint was maintained but the scaling of the materials (the intervals) was inverted, with acoustic dissonances the rule and consonances the exception, I realized — in one of those late night revelations that only teenagers get on a regular basis — that the bigger idea was that the materials as well as other aspects of the contrapuntal program (John Cage's term, in describing his counterpoint studies with Schönberg) could all be considered variables, and that that one might similarly and usefully extend this practice to other aspects of composition: rhythm and metre, harmony, orchestration, form etc.. But the term "disfunctional" carries a connotation of negation, and the negation of functional harmony in particular, which is far from the only idea here. I believe that the program I'm following is more constructive than a negation of existing technique, and the relationship here to existing technique could be imagined as a kind of historical fiction in which someone slipped into music history at particular moments when something momentous was about to happen and instead investigated other possibilities, the paths real music history happened not to take. To a certain extent this program shares aspects with neo-classicism, even a generic, or "wrong-note", neo-classicism, and the work has been informed by those working in the algorithmic replication of existing styles, although John Cage's cheap imitations and erasures of existing music are probably more to the point. But the greatest influence probably comes from the composer Jo Kondo, who described his own work as "The Art of Being Ambiguous", without ever really spilling the beans about what, exactly, he is being ambiguous. The term I'm coming 'round to liking is "not yet tonal." This phrasing suggests the music-historical problems which concern me (i.e. is Machaut tonal? is Javanese Karawitan tonal? is early Cage or late Stravinsky tonal?) , but also leaves it open to the possibility of being an active compositional issue as well as an issue of musical perception and aesthetics. Importantly, the field of associations for this idea is open to other concerns which have guided my work, including the relationship between musical intonation and tonal practice and the relationship of these to timbre and rhythm, as in all of these parameters or domains the same mode of operation, what would happen if _____?, is at play. Jo Kondo zeroed in on La Monte Young's Composition 1960 #7 (the piece with the b-f# perfect fifth "to be held for a long time") as a minimum, which I take to be a minimum state for a form of tonal music, and if not yet that, at the least it is a seed for a potential tonal music. In fact, Young's score, in its apparent simplicity, forces one to engage with a huge field of possibilities opened up by the acoustic nature of the described event, the problems of performance practice, and the particular aesthetics of the content and form described by the score. How long is a "long time" (Young comes from a faith tradition in which "eternity" and "all time" are distinguished, wo he has plenty of patience) and how does it end? With which and by how many instruments is it to be played? How is the fifth intoned, tempered, or beatless, matching spectra as closely as possible? Why the particular fifth b-f#? Why an open fifth, and not a triad (although, with rich spectra, a major third will emerge)? From such a set of questions, one could almost construct an entire repertoire (and perhaps Young has done exactly that). [MR. MONEGAN:] Pertaining to the moose, I said that in the moose kill, for example, if you wanted criminal charges brought against Wooten for actually pulling the trigger on a technicality, his wife did have a permit, and she was with him. If she was standing with him and he's the only one that just pulled the trigger, did that violate the letter of the law? Probably. Did it violate the spirit of the law? I don't think anybody's going to charge it. But if they did, if there was a criminal act there, there would be more people that would be culpable of being charged than just Wooten. MR. MONEGAN: Well, the wife, it was her permit. She willingly allowed somebody else to use it. It also -- once the moose had been shot, it had been drug, according to Todd, by Wooten in the back -- from the back of a truck to the location where it was butchered by the governor's father. And so I pointed out that there are people also involved in this incident that theoretically could also be charged. And he said, I didn't want that. I only want Wooten charged. Well, we're not that way. If there's somebody who's guilty, we have to hold everybody accountable for their actions and their decisions. (from The Branchflower Report p.23-24). PS: If you'd like an example of Krugman's most speculative work in trade theory, here's his paper on The Theory of Interstellar Trade. Last night, the German ZDF network broadcast one of those award shows, this time the German Television Prizes. It was said to have been interminable, and gauged carefully to a lowest common denominator of entertainment, like award shows everywhere, but perhaps with a touch of that special teutonic knack for endurance and exhaustion thrown in (e.g. a technique unique to German comedians appearing in such evenings is that of telling a joke, then explaining the joke, and then repeating the joke very carefully while explaining again at each step why the joke is funny). The token intellectual high point of the evening was to be an award for life's work to the critic Marcel Reich-Ranicki. The 88-year-old Reich-Ranicki, though once associated with the progressive Gruppe 47, is now a conservative figure and — through his publishing connections — an assembler of to-be-dreaded-canons. Theory and analytical depth are not his strengths, but he is, nevertheless, an important figure in post-war Germany as a gifted advocate for literature to a broad public via both newspapers and television and, increasingly and most usefully, someone who is willing to play the role of the crotchety old neighbor (in a country which lost too many of its crotchety old neighbors) who is always willing to call BS when appropropriate. Which is exactly what Reich-Ranicki did last night. After sitting through far too much inanity, and threatening to leave the even early, his award was rushed to an early part of the program. The critic came to the podium to turn the thing down, and then did exactly what a critic should do: criticizing the evening's program („Blödsinn, den wir hier heute Abend zu sehen bekommen haben“) and the current state of network television in general, leaving a very uncomfortable audience full of folks who make good livings from the status quo of German television. (A video of Reich-Ranicki's appearance is here). Readers of this page know that I don't have much use for the viewpoint that holds that critics need be associated with staff positions in newpapers or tenure tracks (as that tends to lead to the viewpoint that the only good critics are those with these particular professional associations), but criticism itself is essential and thus, critics, in whatever employ or via whatever media — in print, broadcasts, classrooms, blogs (yes, even blogs), or just plain conversation among friends in the bar or donut shop in the wee hours after the concert has long finished — are essential, too. In our world, such as it is, we're in desperate need for our crotchety old aunts and uncles willing to call BS when BS is on display, to make suggestions about matters that might be improved, and, maybe, to dote a little when someone does something well. If you're composing experimental music, then you're used to thinking of your new work in terms of thought experiments and you've probably had ample experiences with the delicate process of deciding which thought experiments are worth pursuit and which are best left alone. And naturally, as a composer of notes rather than words (those damned defeating words) , the mind wanders to consider what, roughly or exactly, would be the equivalent of nurse romances for a composer of contemporary art music, circa 1950. Electric organ sound tracks for the waning radio soap operas, perhaps. Or music for health education films. Or music to accompany upscale shopping or tearoom dining. Or Sweet Adeline quartets and choruses. Or Salvation Army Band revival songs. Or Girl Scout campfire songs. There's no exact parallel, no precise fit, and it's hard to imagine any of these genres being able to accomodate everything one might want to do — technically, expressively — as an art music composer. But a little tourism among non-arty genres does quickly suggest that there is scarcely a genre or musical topic area from which an art music could not, at least, potentially avail itself, while the opposite potential cannot be said to exist for such genres, which are tightly constrained. Let me be clear that the art music treatment of genre material is not the same as the synthesis of new repertoire for the given genre, for art music takes the generic and places it within a unique frame, contextualizing, interpreting, and commenting on not only the material but the genre, circumstances and milleau from which it comes, an operation involving a simultaneous distancing and appropriation, a combination which is, usually (but not quite always), scarcely possible within a well-defined genre. I realize that there is something of an imperialist tone to this enterprise, and we should, of course, proceed with great ethical and aesthetic caution. Otherwise, we risk falling into the trap of (that famously imperialism-serving) composer Karlheinz Stockhausen, who once (famously) insisted to Morton Feldman that Feldman's music could be a Moment in his, Stockhausen's, music, but not the other way 'round, totally misunderstanding that the placement of Feldman's music into a series of Stockhausen-y Momente would completely rob the music of the formal and material framework with which Feldman's music is identified. The shock of the old. 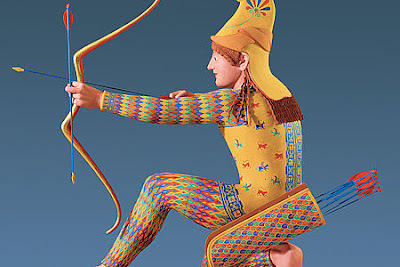 The Liebieghaus, the sculpture museum here in Frankfurt, is now housing an exhibit of reconstructions by Vinzenz Brinkmann of classical Greek sculpture with the original painted surfaces restored. The familiar, 19th century, view of white marble antiquity just vanished for me with these pieces. At first they appear garish, with the skin, lips, eyes too real and the costumes too bright and loud. But then they start to make too much sense: after all, if you are going to invest in a piece of marble sculpture, you want to put it in the Sunday best. One of my favorite late-night party topics has been my defense of David Lynch's Dune as the best movie we've never seen. No, not that deadened and incoherent heap that showed up in cinemas, and even less those that ended up on TV, video cassettes, or DVDs. No, the best film you've never seen was an over-stylized and baroque space opera, with sets of palaces and spaceships constructed of massive wood (and sandworms with skin made of thousands of prophylactics), all of it covered with ornaments befitting the representation of a decadent culture that had been spacebound for a very long time. (Ideally, the film would have moved at a glacial pace — slower than gagaku, as slow as Ernie Gehr's Eureka — so that every detail could be considered and absorbed, and the whole accompanied by a film score with similar temporal sympathies). It was largly the ornamentation in that universe represented in the film which made the film shocking and exotic to us (then-)20th century moderns. There are many explanations for our modern horror of ornament. These are primarily practical and economic reasons which we have come to identify as aesthetic: mass-production favors simplicity, first-world labor costs rose to the point in which hand-made ornament was unaffordable, price trumps quality and variety. But the practical and economic rationale is soon forgotten and we come identify an aesthetic in necessity. Sleek and slick, bare and aerodynamic is modern, weighty ornamentation is not. It needn't have turned out this way, of course. The ornaments of the steam age could have left us with a more permanent steam punk aesthetic. And there were early signs of concern, for example, those of William Morris, who insisted, in an age of industrialization on a place for ornament in everyday life (and, within the same project, a more equal footing for crafts with the "pure" arts). Some postmodernists have attempted to recover, if somewhat modestly, a place for the decorative. In serious music, the ornament lost out early. It was Schönberg's Harmonielehre and not Schenker's that had a decisive influence on subsequent music making; while Schenker's theory describes music in terms of hiearchical layers of deep structure, elaboration, detail and ornament, Schönberg's theory is an account for every possible item as a citizen of more-or-less equal stature in the society of a score, which is perhaps a historical irony given the stylistic richness of the tradition in which his music emerged as well as his own ultra-expressionistic tendencies. Thus we end up with the grace notes in Webern's Variationen (which, ultimately, become the grace notes in Stravinsky's Movements or in any number of works by Barraqué or Boulez) which are no longer ornaments, details of the surface, but elements that go as far down deep into the structure of the composition as one can go. They are neither optional nor conventional, like Baroque agréments, they are essential features. To some extent, we modern musicians should be envious of those practitioners of ethnic, vernacular and early music traditions in which ornamentation, and especially the extemporaneous application of ornament, is a vital part of performance. While it's reasonable to shy away from the over-application of ornaments — as in the required and tired melismas in popular singing competitions — it is, perhaps, worth considering the implications of a more ornamental compositional and performance style for new music. Sometimes, it's just too easy. Reorganizing bookshelves has been an excellent opportunity to ponder the suitability of this volume or that for operatic treatment. Some books are obvious, no brainers even, as opera subjects... any one of the short novels of Ronald Firbank, for example, or one of those totally fake chapters from The Travels of Marco Polo, or Nicholson Baker's Vox, which has Menotti's The Telephone beat in every possible way (so to speak). But more interesting possibilities are definitely to be found in those books which are less obviously opera material: how about Henry Petroski's The Book on the Bookshelf, a history of, well, bookshelves, or a 1968 copy of the Wolf Cub Scout Handbook, or Nabokov's Pale Fire? (2) The Earthly Delights chapter from Luis Buñuel's memoir, My Last Breath. No, strike that, this is better: Robert Bresson: Notes on the Cinematographer. *I had to include a food-related text, but Baker's The Gentleman's Companion, the obvious choice, is just not difficult enough; I also considered The Joys of Jello, an interesting feminist document, and the brutalist The Roadkill Cookbook, rejecting both for lack of opera-plot-level conflict. The great economic crisis initiated by the crash of 1929 coincided with an aesthetic retreat from the musical ultra-modernism of the early century. While economics was far from the only cause of that compositional hunkering-down — in part, it was also a typical stylistic counter-movement at a generational juncture — the conservatism was a broad movement, shared, in many aspects, by very different economic/political cultures. Without suggesting a repeat in music history, perhaps it would be useful to consider how, if the present global economic crisis widens, a similar mechanism might come to affect composition in our time. I take considerable comfort in the capacity of contemporary media to sustain a plurality of musical repertoires, styles, and concerns, and note that the same media have made possible an historically unprecedented privatization of the music-making and listening experiences, but nonetheless it is important to recognize that enormous social upheaval does have potential to strongly influence, if not control, the channels and means through which music is made public, shared, and sold. Can we anticipate new waves of nationalistic and patriotic music? new music connected to revitalized labor movements? neo-socialist or neo-capitalist realism? neo-neo-classicism? Music has the capacity to be at once of the time, in advance of times to come, and very much behind the times. (I just listened to a broadcast of recent Stockhausen, whose music remained curiously locked into step with a vision of the future that dated somewhere around 1958), a situation that troubles me not at all. If, however, circumstances external to music are to force musical production and distribution into one direction or another, then concern is real and urgent. Rudimentary, my dear. In grade school, I started playing trombone the way most wind players probably begin, without private lessons, but with a group of other beginners on winds and percussion, preparing to join a band. One of the great advantages to this, is that the alert student picks up much about each of the other instruments. In my case, I learned all the trumpet valve combinations and clarinet or saxophone fingerings, and, listening to a pair of drummers slowly master their snare drum rudiments — the building bricks of drumming: strokes, bounces, rolls, flams, paradiddles, drags, ruffs, and ratamacues —, repeating them over and over again with increasing velocity was like overhearing the secret code of an ancient and most mysterious craft. (Here's a nice online rudiment collection). One of the most exciting things about the rudiments was that the names often sounded like the rhythms themselves, and one could learn them not only by playing on a snare drum or practice pad, but spoken, a rhythmic solfege. (There are a number of traditions in the world for the vocalization of rhythms, and the most highly developed is probably that of Solkattu, used by South Indian musicians (here's an excellent introduction to Solkattu), which many western musicians have usefully integrated into their rehearsal technique.) I'd really like to see the traditional snare drum rudiments further developed as a vocalization system to help with learning complex rhythms. In any case, the body of rudiments is extremely useful to a composer in imagining how percussion parts are articulated, and time spent with a percussionist or learning them oneself is time well-spent. Robert Ashley put it this way: short ideas repeated massage the brain. A notion taken, no doubt, from the advertising idea of the subliminal message. The question is: do we really want to do that? When anything is repeated often enough it can disappear into the landscape; a musical idea can be repeated so that one no longer listens to it with any degree of attention; news of the world, even when most important or dramatic, likewise disappears when it becomes routine. You know the story: subliminal, sublime, and ignorance is bliss. I am just old enough to remember body counts from Vietnam on the evening news; the US population was deeply divided between those for whom this was a daily outrage and those who had become numb to the passing statistics (numb enough, that is, to twice elect Richard Nixon President). Paul Bailey's requiem for a high homicide enclave, uses repeated patterns (taken from Purcell's Funeral Music for Queen Mary), orchestrated with the most familiar (and thus, most anonymous) of instrumental resources (e.g fuzz guitar) to accompany video footage derived from LA homicide reports. By foregrounding repetition as a musical element, Bailey's music does not to lull into passive-consumptive listening but rather allows the listener to focus on the slightest of changes, revealing that apparent repetitions are not precise duplicates, and the video, by identifying single victims from among an anonymous statistical mass, allows information that has passed out of consciousness through its daily and leveling repetition to be recovered and, perhaps, once again become meaningful. A massaged brain may well be stimulated rather than numbed. Much postwar serious music has been concerned with a null point. Cage's rhythmic structures began from a division of the whole duration into parts prior to the distribution of sound or silence among those parts (in one version of the composition of 4'33", Cage described the piece as resulting from the same method used in Music of Changes, but with the questions as to content each answered similarly, with silence). In Cage's music, there is an implied nullification of sound by silence, in that one is replaceable by the other, as opposed to the classical ancillary function of silence to articulate musical sounds. Much serial music was marked by the perpetual succession of aggregates, in whichever parameter, pitch (class and register), metrical position, dynamic, instrumentation, thus never progressing but always resetting back to zero before beginning again. A major interest of the European avant-garde was the composition of music that stood in some negative relationship to tradition, negating tonality, metre, continuity, genre, style, or composerly authority, another net sum of null. And the most radical music was and is concerned with the limits of music making, limits of audibility, density, repetition, meaningful continuity. The object here is not an equation summing to null, but the direct approach to null itself. I just switched from a cheap 49 key midi keyboard with tiny keys to one with a cheap midi keyboard with 88 full-sized keys. I don't use the keyboard for performance, just for entering notes (and even then, my note entry methods are promiscuous: mouse clicks, command line, computer keyboard, midi file, whatever does the trick for the job at hand), so the mechanical quality of the keyboard is not so important, but having full-sized keys is a nice benefit for my hands and the added range is the main attraction. For years, I had got along fine with the smaller ambitus under the motto that "constraint is a good thing" and, generally, working within the constraints of a limited pitch gamut has been useful. But, one does not always use the same limitations, and the added step of transposing up or down octaves is real added working time. Moreover, for some work in alternative tunings, it's useful to have extra keys to assign to extra pitches. I probably could have gotten along with 5 or 6 octaves — typical harpsichord or fortepiano ranges — but the commercially available keyboards all tend to be C-to-C keyboards, when an F-to-F would actually be more useful for the music that interests me. In any case, if I want to return to limits, I can probably just turn of the undesired notes, making it a soft- rather than hardware issue. As long as I'm at it, isn't 88-keys a somewhat odd standard? It doesn't end at a number of complete octaves, and the lowest A seems arbitrary (the Viennese Bösendorfer and Australian Stuart and Sons do produce instruments with more extended bass keywork). 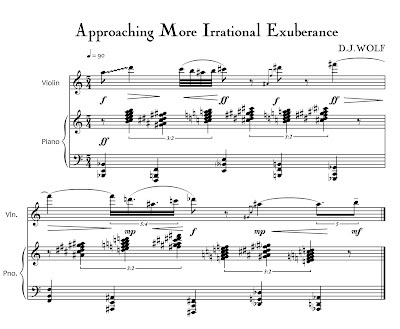 The extreme range is used infrequently (although to good effect in a small number of pieces — Gordon Monahan's Piano Mechanics, Graciela Paraskavaides's Un lado, otro lado) and while the extreme bass can contribute much to the resonance of the instrument through sympathetic resonance, the upper octaves do much less (on smaller instruments, the dampers even stop around f'''). One of the few examples of a piece in which the entire range is used productively is Douglas Leedy's 88 is great, for piano, eighteen hands, a miniature for nine players at one instrument, written out in a kind of tablature, a work that requires very careful choreography and a sensitive placement of music stands. I did write one piece, in high school, in which I treated the entire range of the piano as a row (inspired by Cage's 25-tone techniques) and, later, Ron Kuivila described a piece in which a keyboard was built or programmed in which keys would get turned off once they had been used too often, which strikes me as a sweet way to improvise in a pseudo-serial texture. But you'd probably want to have one of those keyboards designed for children, in which keys have little lights underneath, indicating which ones have been used up and which ones are still active. But, don't worry, though I'm willing to do a lot, I'm not likely to go that far. This is the one-thousand-first posting at Renewable Music. Within that extended period of time, there have been temporary and local variants in notation style, but most differences are minor enough that competing versions of sign graphics are usually interchangeable. Indeed, most contemporary scores are assemblies of signs and conventions gradually accumulated over music history rather than the representation of an overall design concept. The clefs — the treble especially — have images that stabilized rather early in this period, and these images (alongside those for rests and the serifed fonts associated with piano pedaling and numbering of rests) have a decidely archaic quality. I was recently playing around with a change in my own engraving style, switching from traditional wavy flags on eighth and smaller notes to straight angled flags, as a small salute to modernity. In the same spirit, I then decided to push the point a bit further and seek out a more modern-looking set of clefs. This has proved to be much trickier. First of all, because my computer graphic skills are limited, but more importantly, because defining the necessary or desired features of these signs is just plain hard. Should a clef extend in height beyond the staff? Should it emphasize the vertical or lean backaways? Should a clef legibly represent the note to which the clef is keyed (G, C, F)? Should that note be pointed to graphically (e.g. with an arrow or a colon or crosshairs)? Should the clef be straight, angled or curved? Should all parts of the clef have the same width? Should it have a tail? How much of a spiral should it have in the middle? Is the loop at the top round or pointed? Should there be the serif-like circular (the ball at the bottom of the tail) and pointed ends? How far away from a traditional clef can you get and still have a recognizeable clef? What are the advantages for composition of understanding traditional systematic relationships between poetic metre and music (in terms of classical Greek science, between metrics and rhythmics) as well as between dance and music, even though those connections connections broke down long ago? Charles Seeger's still-astonishing essay on Dissonant Counterpoint (1930) can serve as a model. Seeger maintained the structure of species counterpoint, but treated the intervals as variables, in his case inverting the consonant/dissonant spectrum, but also — if implicitly — suggesting, that other selections of intervals could be possible. An extrapolation of this model into alternative intonational regimes, for example, is an obvious consequence. Likewise, if we maintain structural aspects of traditional metrics/rhythmics , but substitute other values, there is considerable new territory to explore. For one example, the metrics of dance are largely predicated on the arsis/thesis model, in which what goes up must come down, and a right step must follow a left, thus leaving the dancer (and the accompanying music) in a constant process of recovering equilibrium. Music, without dance (and dance without gravity, for that matter*) is under no obligation to such balance. For another example, most dance and poetic metre is based on a proportion of long to short steps of two to one. (Think of the foxtrot's slow-slow-quick-quick.) What if, instead of two to one, the proportions were more subtly uneven, two to three or three to four, or, alternatively, more dramatically uneven, three, four, or five to one, or a relatively prime combination like seven to three or five to two. Perhaps useful in this regard is one well-known example, at the subdivision of a beat level, in American "swing" style, in which the proportion of the beat division varies with tempo, so that at more leisurely tempi, the proportion is close to two to one, but as the tempo increases it gets ever-closer to an even or "straight" one-to-one. *One of my favorite dancers, Susan Matheke, used to encourage her students by shouting "Levitate! Levitate!" In this spirit, my first piece for dance was called School of Levitation. From time to time, I make a project of learning some new trick with the computer. It all began with Formula, the Anderson/Kuivila Forth-based music language (Formula was especially effective in sequenzing complex rhythmic events), long ago on an Atari ST. Then I tried writing my own notation program, then used the same Atari to drive a Rayna Synthesizer to do some high-harmonic series sound installations. Moving onto a PC, I made a point of kicking the tires of a number of programs, including CSound and, more recently, PD, if only to keep an ear out to current habits and possibilities. But mostly, I've been a notation tourist, and have seven engraving programs currently on my machine, just to have as complete a set of tools as possible (I also keep my rapidograph and calligraphy ink pens in good condition, so I can function pretty well without electricity, too). Most recently, I've been exploring Graphire Music Press, which is probably the best engraving program you've never heard of. Input is very easy, workflow efficient, any item on the page can be moved anywhere, and the font is particularly fine. It can do some things, like polymeters, with ease, that big famous programs do either not at all or via giant ugly kludges. Unfortunately, Music Press is an orphan, no longer in development, and some aspects are either rudimentary (i.e. midi) or were left unfinished when the firm went into Limbo. In an ideal world, a program like this would be bought up by someone generous, opened up, and turned into free software for further development, but we're in this world, and this tool, imperfect as it may be, is still quite useful. If the pop music industry* can't figure out if music is a product or not (see here, for example), then how the heck are serious/art/classical/scare-the-dog-modern music types going to figure it out either? The only strategy I've been able to figure out is to view the work as a service, and not a good, and one that is executed in a gift economy. (In such an economy, there is plenty of exchange, but the goods and services are not predictably, meaningfully, or consistently convertible into the medium of money). This strategy is at least consistent with some other peculiarities — like not doing recordings (in favor of live performances, both public and private), and avoiding work that requires large institutional resources — but, according to a standard once counseled by my father ("rich or poor, it's better to have money"), my model is not functioning particularly well either. A better model is in order. * I always have to stop and laugh when I see the words music and industry marching side by side. How much more interesting would 20th century American music history have been had the musician's union been part of the IWW?